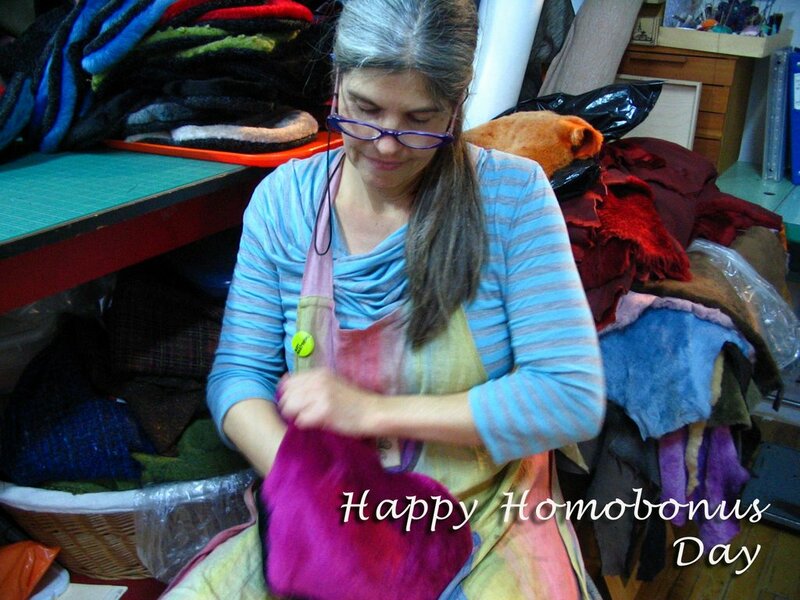 Yes that says Happy Homobonus Day. I do not belong to any organized religion. In fact I am a strong believer that a person should listen to their inner spirit. It is my guide and it helps me to bring good things into the world. "Do unto others as you would do unto yourself". I know that I must be accountable for my actions towards others, every day I strive to improve myself in all directions in life. I recognize I can always do more for others and improve myself to be a kinder and more tolerant individual. If we all worked on that, more JOY would be around the world! 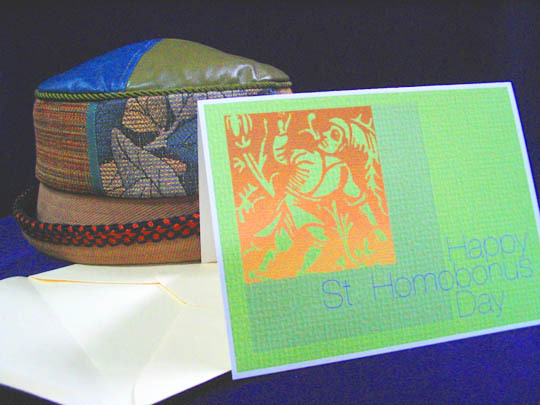 Every year my artist friend Anthony gives me a card to celebrate the patron saint of the cloth worker / small business owner. 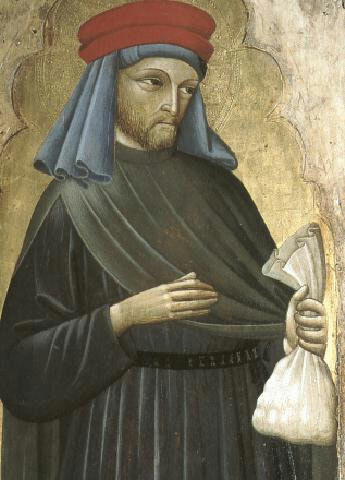 This man was canonized in in 1198, a year following his unexplained death . It was a first in Catholic history; that an ordinary man living a extraordinary life, of goodness and sharing with those around him, was sainted. If you are devoted to textile creations best wishes for you on this November 13th lets all say to each other Happy Homobonus day. It will be fun to see the facial looks you get when you greet someone. I also think it is great to celebrate people whenever we can. In this case, learning about a person who lived a little over 800 years ago. A person in his life-time made the world a better place. Today we have new inspirations all around us. We just have to begin one of them ourselves as more just follow. I believe sharing positive energy is like ripples in a pond, they spread out. Some Heart Hugging for all! Several years ago I made a stuffed heart for a decoration. Recently I used it as a sleeping arm support close to my tummy. 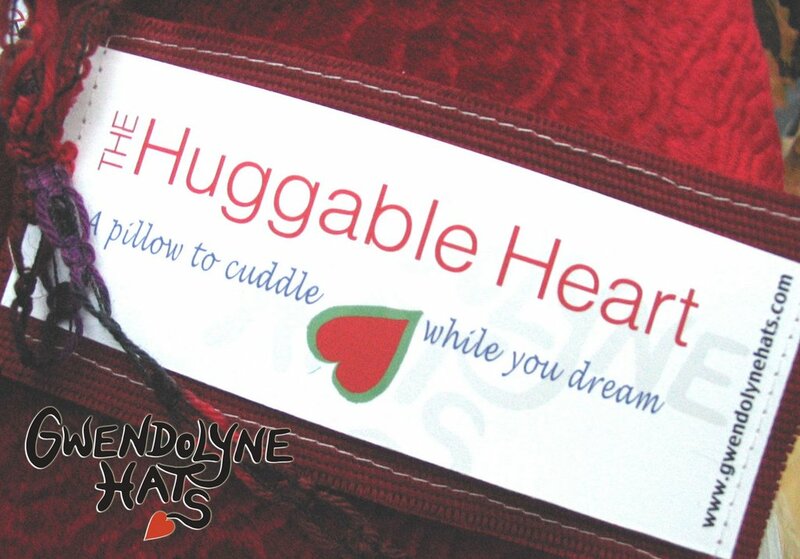 Loving it, I was inspired to begin this new project "The Huggable Heart". There are two sizes; the Large is $45 Cdn, and the Small is $35 Cdn. So if you are looking to for a unique gift contact us at Gwendolyne Hats. A portion of the pillow sales are going to Regent Park School of Music, helping inner city youth to follow their dreams. Many of my customers who shop just before the holiday season, want to leave our store with something special for someone else. Hat sizing can make Hat gift giving very tricky. 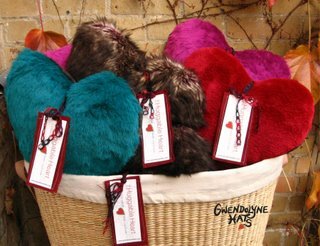 I think that people get the best hat from us when we are able to connect with them personally, whether it is over the internet, or here in our shop/atelier that is located in Toronto's fashion district. Our fifteen years of knowledge comes in handy. We take pride to make our customers happy. Thursday Nov 23rd till Sunday Dec 3rd we will be displaying our creations in Canada's largest artisan show called the One of a Kind Show in Toronto. We will be in Booth I - 45. I will try to take some great photos to share with you later! Recently I was inspired by a video on Youtube. This site is powerful it can bring people together, sharing ideas and beginning movements. If you have not seen this “free hugs” video here it is. I hope you enjoy it as much as I did. Juan Mann from Australia, the creator, is now taking his project further and now building a campaign of where people can find and help each other. Like a stone dropped in the water, the ripples spread out. Every year our Textile Museum here in Toronto invites artists to submit a piece of original art for their annual fundraising Shadowbox event. In the last several years making a fiber art work for the show has been refreshing break from my hat making on going creative pursuit. 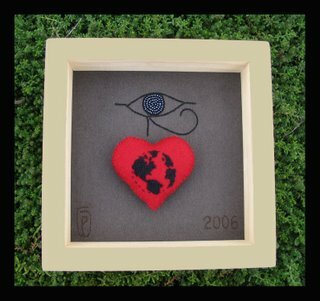 This year the piece P'tah was expressing my belief that the world needs to connect with love for all living matter on this planet. 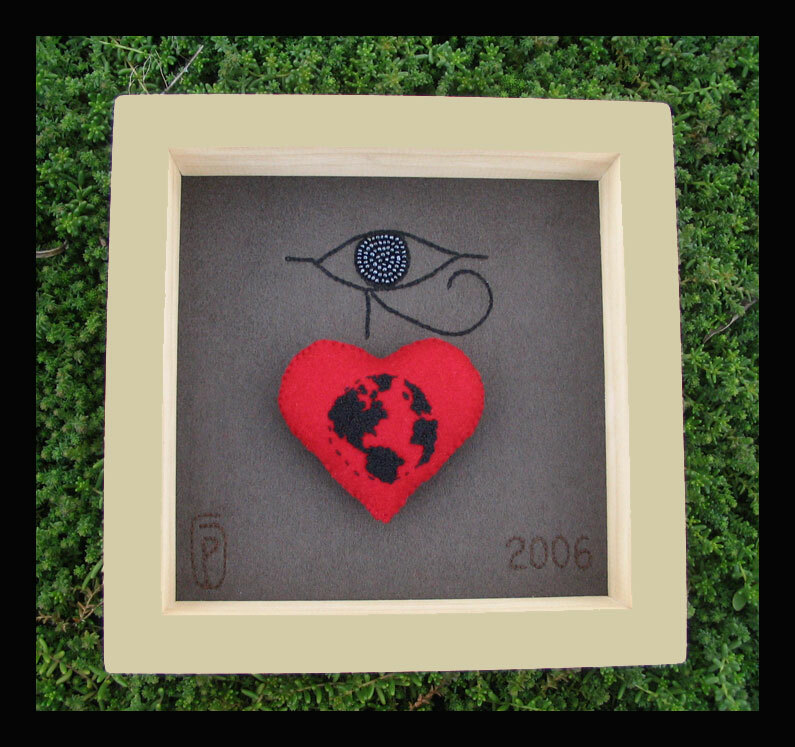 It is made from melton wool, glass beads, wool felt and cotton thread. At this time in the earths’ history is it more evident that our actions during our lifetimes leave an positive imprint. Our priorities need to be encompassing the whole world and not just ourselves. It is what we support that governs what will flourish and what will disappear. Our lives only have the meaning that we give it. I see another beautiful day outside today.